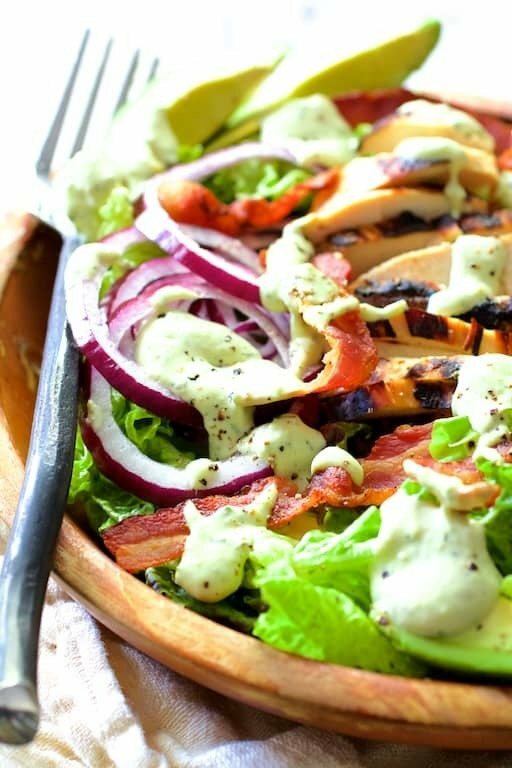 Chicken BLT Salad with Spicy Avocado Ranch Dressing is fresh, cool, crunchy and the perfect way to use up grilled chicken. Combine all ingredients in a food processor or blender and process until smooth. Refrigerate until needed. Cut the bacon strips in half widthwise, then cut in half lengthwise to create four "mini" strips of bacon. Place in a skillet or saute pan. Cook over medium heat until crisp. Drain on paper towels. Place lettuce in salad bowls or on a plate. Top with chicken, red onion, tomatoes, avocado and bacon. Drizzle wtih dressing. Serve immediately.